Ih the years after WWII and the fifties, a modernization of the wireless equipment of the Swiss Army was absolutely urgent. The Swiss army still relied on the "Light Portable" station, a station designed in the early thirties which was quite reliable but had to be carried around by four persons, and some recently acquired U.S. americal surplus sets operating of higher frequencies in FM mode and thus being incompatible with the older equipment. 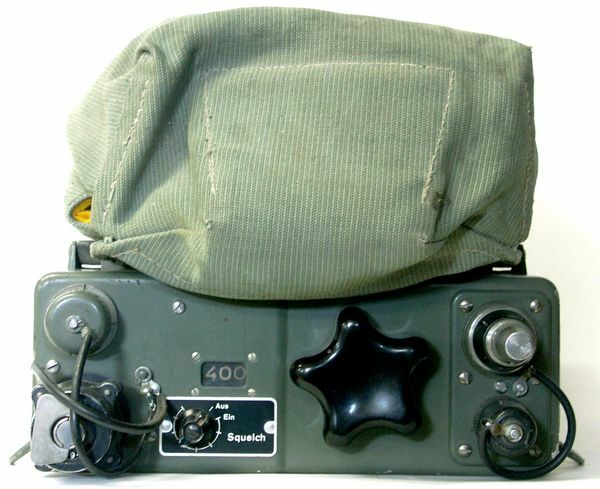 The wireless stations SE-206/209 (similar sets, different frequency range according to the different troops) could be used as portable manpack set as well es vehicle mounted on jeeps, VW Bus and Mowag. From 1953, the War Technical Dept. made an order to develop a new transceiver for portable and mobile use for the infantry and motorised troops. In 1954/5, Autophon could already present a working prototype of their SE-206 (partly based on the rotary channel crystal drum as found in the SE-101) and won the contract for a first production run: these sets arrived at the troops for testing in 1956/7. 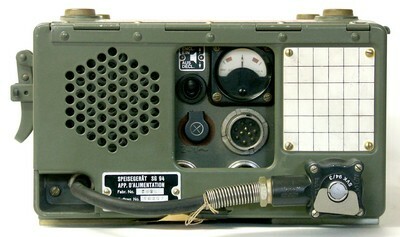 After the immediate success of this transceiver, until 1959, around 9'500 sets of the types SE-206/9 have been produced. The transceiver TR 94 comes in a olive green metal case quite stuffed with valves (17 of them) and other electronic components. All controls are placed on the small face of the set. The dimensions of the transceiver are 237 x 91 mm (w x h) and it's dephth 345 mm, it's weight 11,3 kg. A canvas bag with all accessories (microtel, similar to a telephone handset) is attached like a backpack. With three batteries of 1,5 Volts (ALN 10001) and five HT / anode batteries of 51 V (ALN 10051) or two batteries of 103 Volts (ALN 10103) and one of 51 Volt (ALN 10051), the R.F. output power is 0,6 Watts, with the hand cranked generator or the external power supply, it will reach 2,5 Watts. The front panel has very few controls to simplify operation: at the left, You find the connectors for the microtel (handset) and the cable from the power supply, nect to it the combined on/off, volume and squelch switch. The channel selector looks like a star, the channel number is mechanically displayed in a small window next to it. At the right hand, You find the antenna socket and the telescopic antenna. The transmitter frequency resultas in the combination of the signals coming from the master oscillator (22 crystals with 400 kHz channel spacing in the range 45 - 53,4 MHz) and the co-called modulation oscillators (4 crystals in the 10,7 - 11 MHz range) - by combining these two oscillator outputs, the set can tune a number of 88 channels. In reception mode, the incoming signal is mixed with the signal of the main oscillator after having passed a first amplifier step, the first intermediate frequency of 10,7 - 11 MHz is generated. After another amplifier stage, it will be mixed with the signal of the FN oscillator (12,65 - 12,35 MHz, 100 kHz channel spacing) and the second I.F. if 1,65 MHz will be amplified in another three stages. After a limiter stage, the signal is demodulated, has to pass another A.F. amplifier and is fed to the headphones. A main accessory is the Power Supply SG 94, all necessary heater and anode voltages of the transceiver are generated from a 6, 12 or 24 V DC car battery. With an external mains transformer, mains operation is also possible. In the power supply, there is an integrated audio amplifier which will feed a speaker. When connected to a SG 94, the SE-206 will reach an output power of 2,5 Watts. Further accessories are the hand cranked generator HG 94, it will generate the necessary voltages of 1,5 V (heaters), 51,5 and 103 V (HT / anode) and will increase the output power of the SE-206 to 1,7 Watts. A mounting frame MR 94 can be attached with the mounting frame rack MRG 94 on a vehicle chassis, it consists of a support of of the power supply and a drawer to store spares and the necessary tools. 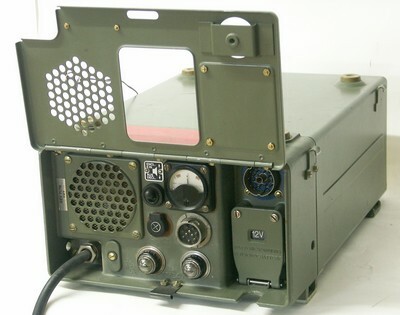 The remote operation box FBA 94 permits to control a SE-206 transceiver over a maximum distance of 10 km over fiel telephone lines; the command post switch KPU 94 allows to directly switch from wireless radio to telephone line communication. A big canvas bag long distance antenna FA 83 contains all material to erect a long distance antenna, the maximum communications range of the SE-206 is 5 - 20 km.